Before you can get to the fun part of taking to the sky, you will need to understand some basic theory of flight. 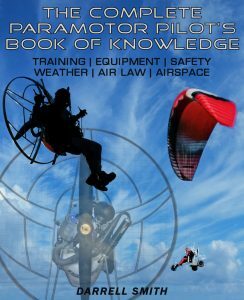 You should also understand the basics of paramotor wing design, and how they work. The better your understanding, the better you will do when it comes time for your practical paramotor lessons. This post just covers the basics; more in depth theory of flight, and lots more important beginner pilot information can be found in the training manual by clicking here. 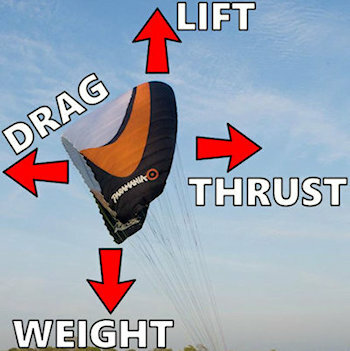 As you can see by the picture below, there are certain forces acting on a paramotor wing. Firstly, you have the weight of the whole paramotor being constantly pulled down by gravity. In order to fly, the paramotor will need an opposing force to act against gravity, this is known as lift. There are two more forces that will affect the paramotor as it's flying. Thrust, which is created by the propeller pushing you along; and the opposing force of drag, that's trying to pull you back the other way. Lift is the result of pressure differences, and it depends on aerofoil shape, air density, angle of attack, and airspeed. As a wing moves forward, air is deflected up and over the top of the wing. This air has to travel much further than the air that is moving below the wing, therefore it has to travel much faster. According to bernoulli's principle, faster flowing air exerts less pressure than the slower air beneath the wing. This pressure difference creates the upwards force of lift. A wing must also deflect air downwards, which can be achieved by changing the angle of attack. Air under the wing is deflected down, and by the Coandă effect, air above the wing is guided along its surface, and down also. Since the air is slowed and deflected by the wing, it pushes the wing up and back, creating lift and drag. This is in accordance with newton's third law of motion. 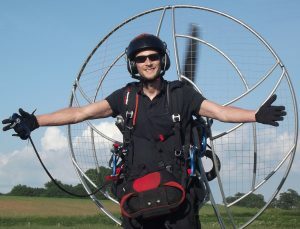 Thrust is the force created by the propeller pushing the paramotor along, this is controlled by the hand held throttle. Once airborne with trims set, speed remains constant; so more power means more lift, and less power means less lift, so you will descend. Unfortunately, the design of a paramotor means there is a lot of drag. The cruising speed will be around 30 MPH for most wings. This can be increased by using a reflex wing with a trim system that we'll get to later. You should also be aware of pitch and roll movements, which will occur as the wing is flying above you. Pitch is the movement of the wing forward or backwards, this will generally make the wing climb or descend. And roll, which is the movements side to side, which generally makes the wing bank, and turn left of right. You may feel pitch as you increase or decrease the power, or thrust, or with brake input. Roll will occur as you turn or weight shift in your harness. Paramotors are quite sensitive to turbulence, so you may experience pitch and roll as the paramotor moves through lumpy air. This usually corrects itself on stable beginner wings without any pilot input. You may also experience yourself swinging side to side like a pendulum. This is quite normal, and will happen after making turns, or because of turbulence. This will usually correct itself, or it can be corrected with very light brake input. Paramotor wings are very loosely based on ram-air parachutes. They use the same basic design, but they are much more efficient. 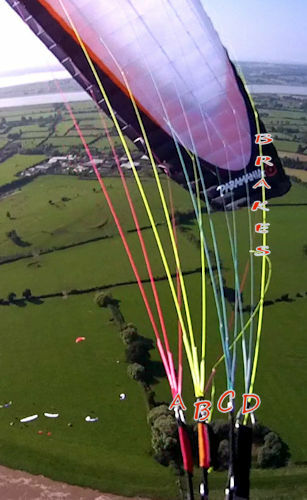 A typical ram-air parachute will have a glide ratio of around 5:1, but a modern paramotor wing will be around 9:1. This means you can fly nine feet forward, without using power, and you will only lose one foot in altitude. A paramotor wing uses two layers of fabric, top and bottom, connected by fabric ribs that form multiple cells. These cells face forward on the leading edge, allowing air to pass through into the wing. As the wing moves forward these cells fill with high pressure air that inflates the wing. This forward motion keeps the wing inflated, and allows it to form the necessary aerofoil shape. When a paramotor wing inflates, it forms a basic aerofoil that will create the lift needed to get you airborne. Lift will be created as you run, and as the thrust of the engine pushes you forward. The faster you run, the more lift the wing will produce. To get off the ground, you will need to overcome the drag holding the wing back, and the weight holding it down. If the take off speed of a wing is 10 MPH, you will have to keep running until you reach 10 MPH in order to leave the ground. If you're running into a 5 MPH wind, you will only have to run at 5 MPH to get airborne. Modern reflex wings will have a trim system, that can be adjusted to give slower takeoff speeds, and faster in-flight speeds. The trim system allows pilots to adjust the lift point, centre of pressure, and angle of attack of the wing, by changing the profile of the aerofoil. This is achieved by changing the length the D and C risers, with a simple buckle release. Trim systems have improved the safety of paramotor wings immensely. By activating the trim system, you will be moving the centre of pressure further forward. You will also be flying faster which creates higher pressure inside the wing. This lowers the risk of a type of wing collapse known as a front tuck. When it comes time for your practical paramotor lessons, ask your instructor to demonstrate using the trimmers. Practice releasing them, and returning them to landing position on the ground before using them in flight. The brakes can also be used to achieve slower takeoff speeds, but one must be careful not to stall the wing. By pulling down on the brakes just before takeoff, a pilot can increase lift, similar to how flaps work on fixed wing aircraft; this will assist the takeoff. 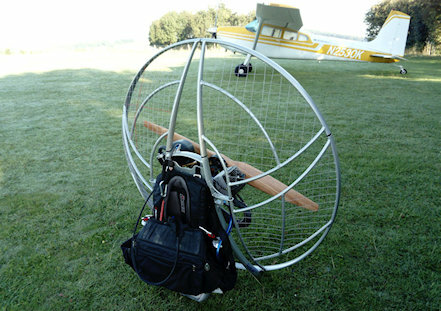 The risers are used to connect the wing to the paramotor, and are made from tough nylon webbing. Strong carabiners are used to easily clip the wing in before each flight, these stay attached to the paramotor. You will usually find four or five points which connect to the lines. Looking at the picture below you can see the A, B, C, and D risers/lines. These lines connect to the wing, A's closest to the front, D's at the rear. There are also brake lines which pass through pulleys on the D risers, and are held there by magnets. These lines connect to the trailing edge of the wing to allow turning and flaring. As you pull the brakes, the rear of the wing will be pulled down, slowing that side and making the wing change direction. The lines are very strong, and are made from Kevlar and Dyneema, they can all hold around 400 KG each. It's possible for lines to snag on takeoff, so regular checks should be made to check for possible damage. I hope you've enjoyed your first paramotor lessons on the theory of flight, and the basics of paramotor wings. Go back and read this article again until its all crystal clear in your head. Remember, the better your understanding, the better your first flight will go. When you're ready to take things further you'll need to arrange some training. You can read all about my training experience so you know what to expect > HERE. And find out all of the equipment that you'll need to get before you can start flying > HERE < and all of the essentials for your kit bag > HERE. Find out whether paramotoring is as safe as everybody's telling you > HERE. Still wondering what the difference is between paramotoring and paragliding? THIS POST will explain everything. Learn how to forward and reverse launch your paramotor - HERE.